Several months ago you had big dreams. Homeschool dreams. Your goals for the school year were as big and beautiful as the tower of books and curriculum that UPS delivered to your door. But now it’s January. And expectations haven’t been met. Motivation is dwindling. You are frustrated, and chances are your frustration is producing a similar emotion in your student. If you are feeling irritated, or if you are facing unproductive days, here are a few strategies to help you motivate learning in your homeschool. If you are unhappy and teaching in an environment of negativity, your child will have trouble learning. It is important to insure that you remain positive, even through the whining, crying, and complaining. If your child hasn’t finished his math worksheets, avoid providing negative consequences (such as telling him he’ll have to do five extra pages if he doesn’t hurry up and finish). Instead, try rewarding your student when he finishes a task or stays on-task. Positive reinforcement is productive–creating a love of learning and fostering a healthy environment. When Elijah was young and struggling (aka whining, crying, and complaining) with his handwriting lessons, I would set five M&M candies on the page. He knew when he finished the page he could have the candy. A spoonful of sugar does help the medicine go down, and if it’s good enough for Mary Poppins, it’s good enough for me. It was definitely good enough for Elijah who started to request his handwriting lessons. Try to focus on your student’s accomplishments (no matter how small) and give praise or a reward when he remains on task. When my dishes are pilling up and spilling over to the counters (and maybe even on the floor! ), I have a hard time motivating myself to get started. The same is true for our kids. A lack of motivation can stem from being overwhelmed. 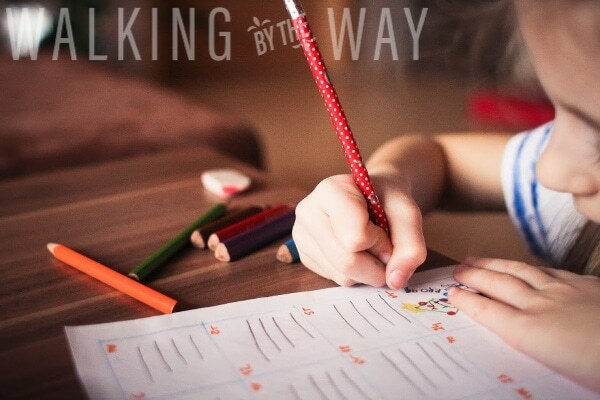 If you find that your student is becoming frustrated, it is important to take baby steps. Help your child break down his tasks into small steps. Ask questions. “What do you need to complete this task?” Help your student gather supplies. “What do you need to do next?” Be supportive with each step. When I was in second grade, I remember squirming at my desk. Tears plopping on the page of the book I was holding. My teacher expected me to read a story, but I was overwhelmed. She heard my muffled crying and came to me. She knew exactly what was wrong. When I tried to read, words on the page were popping all over the place. She took me to her desk and made me a bookmark. She showed me how to move it under one sentence at a time, so I wouldn’t be distracted by all the words on the page. This small act of caring helped me to simplify the assignment. You can take away the doom of the looming task by cooperating with your student. This will foster his motivation to complete his work. Feeling stuck at a desk or in a chair can cause any student to despair. Your student may need to take a break after each subject or when the timer beeps. Encourage him to get up and move. 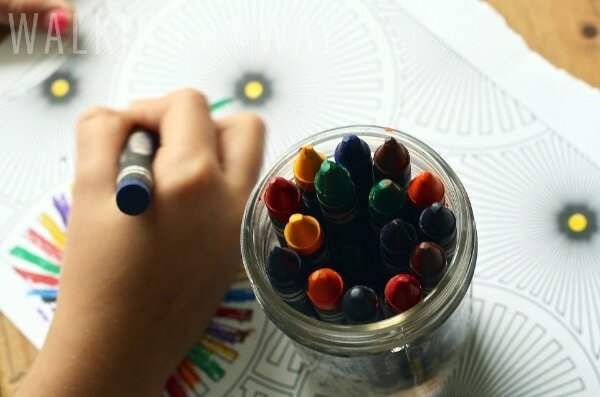 To keep things interesting, implement a Wiggle Jar—the cards give you lots of ideas such as “stomp like an elephant” or “crawl like a baby.” Physical activity will boost your student’s ability to concentrate. Students perform better when they are hydrated. Add exercise breaks and water breaks to help keep your student focused and motivated. Children often withdraw from learning when they feel as though they are being constantly controlled. While it is your job to guide your student, it is also important to empower your student to have a role in his development and schooling. Encourage your student to participate in his education by providing him options to choose from. Give him chunks of time to pursue his own interests. Determine a few non-negotiables (such as reading and math), but let your student decide how to spend the rest of his school day. When we let our students lead, the result is authentic learning. Let your child choose his learning adventures—painting a masterpiece, hiking in the woods, dancing with siblings, composing a song, building a fort, playing with LEGO, caring for pets, reading a book, creating a game, observing your bird feeders, helping with chores, watching a documentary—all of these things are valuable, viable learning opportunities. Learning is relevant and meaningful when your student is making his own choices. The more input and control you allow your student to have in their learning activities, the more motivated and engaged he will be.